Can Santa Get the Sack? Christmas is coming, the goose is getting fat … but so is Santa! He’s now too big to fit down the chimney; the elves think they have man flu; and Rudolf says the roads are blocked with snow so he can’t get to work! 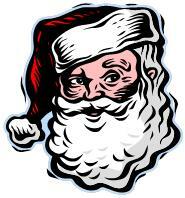 You might think that Christmas runs smoothly at the North Pole – after all, they have all year to plan it. However, this year there are a few problems for the Head Reindeer (HR) department to sort out. Father Christmas is too big to fit down the chimney. All year Santa has been relaxing at the North Pole and as a result, his girth has expanded somewhat. The Head Reindeer is worried that he won’t be able to do his job properly – after all, he is supposed to climb down chimneys in order to deliver presents. Can he get the sack for not being able to carry out the work in his job description? If Santa is morbidly obese and can’t carry out his daily tasks, he could be classed as disabled. This means that sacking him because of his girth may be discrimination – something the Head Reindeer would like to avoid! The elves think they have ‘man flu’. They’re sneezing and coughing and their noses are running, so they’re really like to stay in bed – especially during December when work gets really busy. Are they allowed to take time off sick, when Father Christmas thinks they just have colds? Staff taking time off for sickness usually increases over the winter months, so the Head Reindeer will need to speak to each of the elves and find out what’s actually wrong with them and make sure they have the right evidence to support the reasons for their absence. Keeping in contact with sick staff is always a good idea. After all, how can Christmas carry on without the elves? Rudolf says the roads are blocked with snow. He says he can’t get to the office because of the weather conditions. He can’t really work from home, although for some staff, it’s worth setting up remote access, so that they can still work, even if they’re not in the office. The Head Reindeer needs to make sure that the Staff Handbook is up to date, to cover issues like bad weather. And he needs to find out how else to get Rudolf to work, if there is snow on the road, or Christmas might have to be cancelled. With a little bit of forward planning (and perhaps some advice from an expert) the Head Reindeer (HR) manager will be able to make sure that everything goes to plan for a great Christmas. At least he can let all the elves take time off together, once the festive period is over! How Do Small Businesses Deal with Long Term Sickness? Long term sickness can be difficult to deal with in any business. However, when that business is staffed by just two or three people, when one of them needs to take a long period of time off work, because they are ill, the impact can be even greater. How do you cope without them? How long do you have to keep their job open? One of our clients is a small agency with just three members of staff, including the business owner. Earlier this year, their secretary was rushed into hospital. After three weeks of tests, she was told that she should take another 2-3 months to fully recover. The business owner knew that this was the best course of action, not wanting his employee to return to work before she was really well enough to work again. So that he and his other team member weren’t over loaded with work (which could have made both of them stressed and ill!) they took on a part-time Admin Assistant to cover the work. The boss still had to pay Statutory Sick Pay to his recuperating secretary and, due to changes to the law that occurred in April 2014, he was not able to claim any of this back – something that is easier for larger companies to bear. All through this time, the business owner had kept in touch with his secretary to see how she was getting on. As the agreed period of sick leave was coming to an end, it became apparent that she might not be ready to return to a full-time job. There were other complications that meant that a full risk assessment would have to be carried out, should she return. How long should the job be kept open? Our advice to our client was to write to the employee’s doctor and ask for a full medical report. Even though this had to be paid for, it showed that she was not ready to go back to working full-time. During her time away, the other members of the small team had realised that they really did need full-time support. Because the lines of communication had been kept open, the three of them were able to reach an amicable decision about the future, which suited both of them. The lessons they have all taken away from this situation is to stay in communication (aside from the fact that it shows you care!) and to get advice from an HR professional, to make sure you are complying with employment law at all stages. When you follow these two tips, potentially tricky situations are so much easier to resolve.